Taxes on Investments: Are You Paying Too Much? You Are Here: Home » Investing » Taxes on Investments: Are You Paying Too Much? There are three main realities that will erode your real returns on investments: inflation, fees, and taxes. There isn’t much you can do about inflation, other than to plan ahead, but you can reduce your fees and taxes. DIY investors have an advantage when it comes to fees, but they might have a bit more trouble when it comes to reducing the taxes they owe on their investments. With tax season in full swing, now is a great time to review your investing strategy, and consider ways you can reduce your investment tax liability — and keep more of your earnings. Are You Using the Tax Tools at Your Disposal? A recent E*TRADE StreetWise survey of experienced investors offers some interesting insights into the ways that investors trade in an effort to reduce tax liability. One of the most effective ways to invest in a more efficient manner is to make use of tax-advantaged investment accounts. The survey indicates that 45 percent of investors believe that investing in these accounts is the most effective way to limit taxes on their investments each year. With the right approach, your money can grow tax-deferred. What tax-deferred means is you get a tax deduction now, reducing today’s tax liability. However, you can also look into accounts that grow tax-free. Even though you might pay taxes on your income now, if your future taxes will be higher, you are better off putting your money in the Roth versions of IRAs, 401(k)s, and 403(b)s. The HSA is a great account (if you qualify) because you receive a tax deduction today, and the money grows tax-free as long as you use it for qualified health care expenses later. However, it’s important to understand that there are other strategies out there for improving the tax efficiency of your investments. While a large number of people are aware of the benefits of tax-advantaged accounts, many investors fail to employ other valuable tax strategies. One of the biggest concerns, when you look at this data, is that many DIY investors might not be maximizing their tax benefits. Many investors keep investments that are already tax-efficient in their tax-advantaged accounts, reducing overall effectiveness. When planning out when to buy and sell investments — and where to keep them — it makes sense to take a step back and consider how taxes will come into play. Because DIY investing is becoming such a big deal, there are a number of tools and resources out that there that can help you with your tax planning. 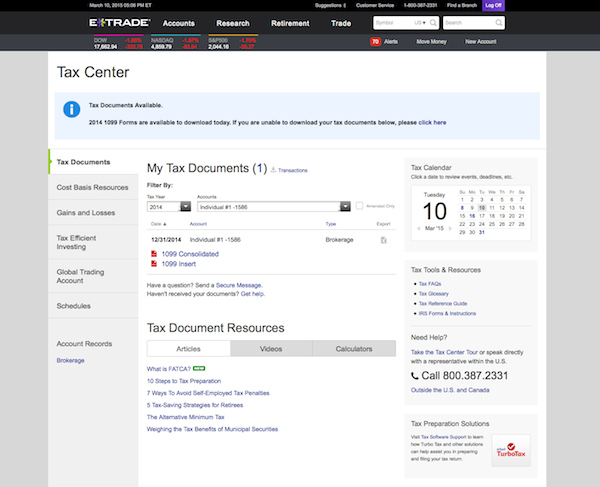 E*TRADE’s Tax Center is one of the resources that you can use to improve your overall tax efficiency (available to E*TRADE customers). It’s great when your broker offers these resources since it makes it easy to plan ahead, as well as maximize your tax savings. A tool like the E*TRADE Tax Center can provide you with cost-basis reporting information, as well as help you take best advantage of tax loss harvesting. Before selling shares of an investment, it makes sense to look ahead to the consequences and make sure you are getting the best tax efficiency out of every transaction. If you want to get ahead as an investor, you need to have the right knowledge and education. Understanding the way money works, as well as being aware of the way that taxes and other expenses impact your overall returns, can help you build more wealth over time. When you lose money to taxes and other costs, you aren’t just down the amount that you overpaid. You also miss out on the compound interest that you would have earned had that money been in your account. Better tax efficiency now can mean a difference of thousands of dollars later on. 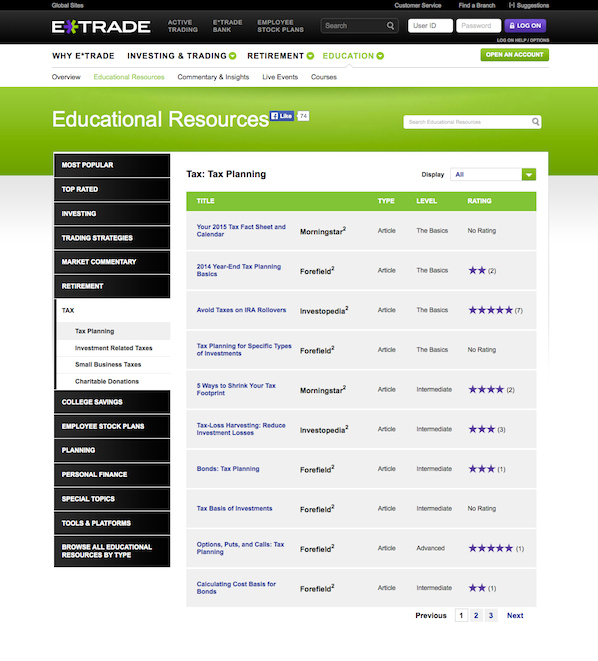 Educate yourself with resources like those available in the E*TRADE Education Center, available to everyone, and learn more about the tax implications of your investing choices. As you educate yourself, you will enjoy more financial power as your money works more efficiently on your behalf. that I think I’d nver understand. It kind of feels too complex and very wide for me. This is why it’s so important to have a financial consultant giving you advice about where to put your money. It might not be a lot of savings, but a little bit goes a long way, and it’s better to save some of it wherever you can!